This post originally appeared on 80 Books Blog! An ARC was provided by the Publisher via NetGalley for an honest review. First, the protagonist is a woman of color (specifically, she and her father are from Saudi Arabia), who is living on the moon and is probably a genius. Second, for those who love this type of story: it’s a caper! Pleased with how this develops throughout the novel. So many specific skills are in play here because the novel is set in space. Adds a lot of drama and is (almost) educational. Third, it takes place on the moon and there is a whole bunch of engineering, chemistry, and math that goes along with that, but, much like The Martian, the book didn’t feel bogged down by the science-heavy language. What elevates this book from most stories set in space is that many of the tropes of space exploration and colonization are flipped. The person who founded Artemis, and remains its mayor is from Kenya. The team that primarily runs life support is Vietnamese. Jazz and her father are from Saudi Arabia, along with many of the welders who live within Artemis. The aluminum plant is run by Brazilians. All of these countries are primarily known within this lifetime as third world countries (not first world, at least), but in this future they are the leaders of a new technological age. The United States and other first world countries are not the primary drivers and creators. I expected the United States to play a more prominent role in the creation of Artemis (based on my preconceived notions), but it seems that Americans are mostly useful as tourists. As a side note, the novel doesn’t delve into what has happened on Earth to change the political landscape, however, it is largely irrelevant to the story. The plot gets started when an Elon Musk-like character hires Jazz to destroy the Aluminum facility on the moon. She needs the money to make up for past mistakes, but the job is not as simple as it seems. Her one person operation turns into a team effort once the Brazilians discover she’s responsible and send for her to be killed. Artemis seems like a happy-go-lucky place, but it turns out there’s a lot going on in the underbelly of society, including Jazz’s smuggling operation. Jasmine (Jazz) Bashara is a fun character. She’s incredibly smart; in one scene she learns about and designs a schematic for a piece of equipment in three hours, which impresses her kinda-sorta Ukrainian love interest, Svoboda. She’s also resourceful; knowing Artemis and the limits of the life support systems, she takes advantage of what she can and solves problems for what she can’t. Her biggest flaw is that she is stubborn and she isolates herself from people who actually care about her, but she is the type of person that will try to make up for her mistakes in her own way. The rest of the cast is skimmed over in character development, since this is a caper story, we’re seeing the whole operation from only Jazz’s POV and we don’t know much about the other people on her team beyond what Jazz shares with us. What’s missing is a lot of their relationship history. We get some of it throughout the novel via interludes of emails between Jazz and her on Earth pen pal/ co-smuggler, Kelvin, but reader’s are limited to Jazz’s side of the story this way. It would have been more fulfilling to know all the characters outside of her perspective (maybe this will happen in the movie?). Also, near the end, that much of the “consequences” (to as vague as possible) were skimmed over or minimized. However, this didn’t impact my rating too dramatically. 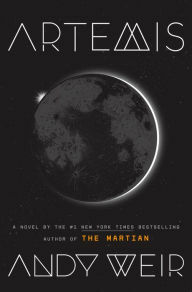 It’s a fun read and fans of The Martian will definitely enjoy it.